By Colin Yates, chief support officer at WorkMobile, an award-winning data capture solution. It may not come as a surprise to hear that each year the construction sector loses billions of pounds because of last minute design and structural changes to buildings, health and safety issues and equipment failures. However, one, often unnoticed area, severely impacting the industry, is poor communication, which is estimated to be costing the sector £13 billion every year. In addition, around 1,500-man hours are also estimated to be lost due to lackluster communication – equating to the equivalent of over two months’ worth of time. Take a closer look and it’s plain to see that the construction industry is still heavily reliant on paper as its main form of communication. You only need to walk onto a construction site to see builders using paper-based architectural drawings and design specifications, or to see paper health and safety manuals. But perhaps what is startling, is that despite the problems paper is causing, businesses don’t appear to be addressing their usage. In fact, our ‘death of the paper trail’ report, found that over a third (67%) of employees operating within the construction sector admitted that paper is still heavily-used whilst on site, and despite the costly implications this reliance is having, a third of businesses (33%) are still yet to take any action to reduce their usage. So, what is causing such a heavy reliance on paper? While technology has progressed over the years, the construction sector has remained fairly traditional in the way it operates, with two fifths (40%) of businesses still continuing to use paper plans such as design specifications and blueprints. This is despite other traditional industries, such as the legal sector, moving towards paperless working – 80% of legal employees stated that their bosses have introduced paper-less working policies. So, why can’t the construction sector shift its paper reliance? Well, this may be down to the sector having an ageing workforce (the majority of its workers are aged between 40 and 50), that prefer to stick to tried and tested methods rather than being open to change. This becomes evident through the sector’s continued use of heavy-duty paper-based handbooks and manuals, that have stood the test of time. However, these manuals are not only inefficient, they can be rendered completely obsolete once a new regulation comes into force, meaning that the whole document will have to be re-printed and then re-distributed to the entire workforce with every change – wasting both time and money. But, despite all the hassle and cost this process causes, employees aren’t even reading the materials and as a result are putting themselves in danger. Our previous ‘WorkSafe’ report found that almost half (43%) of employees in hazardous working environments (e.g. construction) are failing to read their paper-based health and safety manuals that they were provided. And, most alarmingly, almost a fifth have knowingly put themselves in danger because they have failed to read their manuals. Employees putting themselves in harm’s way is not to be taken lightly, as each year around 2.9% of workers in the sector sustain a non-fatal injury – the average injury rate across all other sectors is 1.9%. What’s more, over the past five years there has been a total of 196 fatal incidents in the sector, highlighting that current methods aren’t working and better solutions are needed to solve the inefficiencies and danger caused by a reliance on paper. What can the construction sector do to reduce its reliance on paper? Two of the key characteristics associated with paper are that it is notoriously easy to misplace and damage. And on a construction site that is often exposed to the elements (e.g. rain and snow) and in the presence of hazardous machinery and equipment, the risk of paper documents being damaged or misplaced is amplified. This can be problematic when an important document such as a design blueprint or a material receipt succumbs to damage that renders it unreadable/unusable. This risks putting the whole project on hold as workers cannot follow the necessary building specifications – costing businesses both time and money. Developments in technology have progressed tenfold over the past five years, with new devices and software removing the need for paper that can prevent projects being delayed. For instance, there are now online programmes that can allow users to take digital notes or write up project reports. Similarly, the internet, email and mobile and tablet devices have removed the need for physical documents to be printed, by allowing users to view documents online and send digital copies of documents to themselves or to other recipients around the globe. And these aren’t the only technological developments available. Digital data capture solutions that allow paper-based documents to be digitised have also emerged as a technology that can improve a business’s efficiencies by eliminating the need for paper. Furthermore, because the technology utilises cloud storage, it means that documents do not need to be printed off and then hand-stored by employees, but instead this can all be done digitally and over the internet. Digital storage has many benefits for businesses such as improving worker safety and on-site communication, by allowing workers to access important documents, anywhere and at any time – whether this be on a rural work site or on a site in the city centre. Crucially, the combination of digital data capture and cloud-based storage would prohibit the risk of projects being held up by the loss or damage of documents. For instance, if a worker lost or forgot to bring their design blueprints into work, instead of having to wait to receive a new set from the back office, potentially holding up a project, all they’d need to do is access the app on a smartphone or tablet device that has internet connectivity and pull up the document, so work could continue – saving time and money. Similarly, if an employee was unsure how best to operate a piece of machinery or if they had witnessed an accident at work and were unsure on the correct procedures, instead of having to find their nearest employee handbook, all they would simply need to do would be to take out their smartphone and identify the appropriate action that needed to be taken. For too long paper has been the lifeblood of communication within the construction sector, and while ten years ago this was fine as alternative forms were few and far between, paper is now becoming a hindrance to businesses, by diminishing the quality of communication between parties on and off site. A more reliable solution is therefore needed to help businesses operate more efficiently. 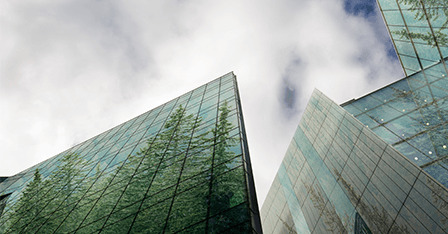 The use of digital data capture, along with cloud and mobile technologies could be but three ways the sector can bring its reliance on paper to an end and start working towards a more sustainable future. Are flood-hit properties an investment likely to sink or swim?